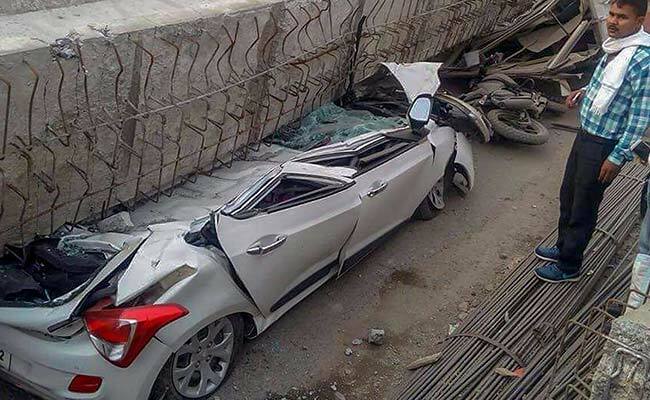 Flyover collapse in Varanasi: Two pillars of the flyover collapsed, crushing people and vehicles under it. At least 18 people were killed after a portion of an under-construction flyover collapsed in Uttar Pradesh's Varanasi on Tuesday. Two pillars of the flyover collapsed in the city's Cantt area, bringing a huge slab of concrete down, crushing cars and a local bus under it. Three people were pulled out of the debris. 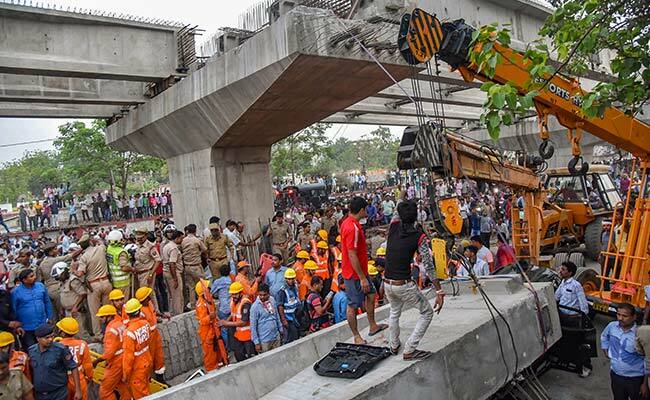 Many of those trapped were reported to be labourers who were working on the flyover. Five teams of the National Disaster Response Force or NDRF were deployed to lead rescue operations. Dozens of policemen are also present at the spot. People gather near cars crushed after a portion of an under-construction flyover collapsed in Varanasi. Eight cranes were used to lift the debris and a crane with a 200 tonne lifting capacity is also being called in. Officials say gas cutters had to be used to pull out those trapped. The rescue operations are over and no one is trapped under the debris according to the police. An eyewitness, who was 50 metres from the collapse site, said the help came in after an hour. "Four cars, an auto-rickshaw and a minibus were crushed by it... The help came after an hour," the eyewitness said. The flyover, 2261 metres in length and at a cost of Rs 129 crore, was being built by the Uttar Pradesh State Bridge Corporation and 56 per cent construction had been completed. The portion of the flyover that fell had been laid as recently as February. Locals and rescue teams gather near crushed vehicles after a portion of an under-construction flyover collapsed in Varanasi. Chief Minister Yogi Adityanath has ordered an inquiry report in 48 hours and has also directed his deputy Keshav Prasad Maurya and minister Neelkanth Tiwari to visit the spot. "The chief minister has expressed grief and directed the administration to speed up rescue operation," UP minister Sidharth Nath Singh told ANI. Prime Minister Narendra Modi tweeted to say that he has spoken to officials and asked them to ensure all possible support to those affected. "I spoke to UP CM Yogi Adityanath Ji regarding the situation due to the collapse of an under-construction flyover in Varanasi. The UP Government is monitoring the situation very closely and is working on the ground to assist the affected," he said. The Congress tweeted to say, "We are deeply saddened by the news of the collapse of an under construction flyover in Varanasi. Our thoughts are with the families of those who have lost their lives. We wish those who are injured a speedy recovery." Former chief minister Akhilesh Yadav appealed to the workers of his Samajwadi Party to assist the rescue teams. He also tweeted, "I hope the government will not just wash their hands off by paying compensation, rather will order a fair investigation."